An "Instrument Petting Zoo" session, a space where children can play and interact with instruments along with the musical team, and . . .
A "Stroytelling Concert" session, where artist-duos Shea-Kim (violin, piano) and Anastasio-Canonic (clarinet, piano) will perform and share stories of music by Bach, Schumann, and Grieg. If you missed our last event, we are so glad to be hosting it again this fall! Please stay tuned for an RSVP Link and a flyer. The Variety Child Learning Center hosted An Evening with Dr. Temple Grandin: Different Kinds of Minds. ​The event featured a Live lecture and Q&A session with Dr. Temple Grandin, a book signing as well as a vendor expo. The SCTL was excited to attend the event and interact with the community and the staff at VCLC! For more details about the event, please see this link. ABCT is multidisciplinary organization whose goal is to enhance human functioning through behavioral, cognitive, and other evidence-based principles and therapies. SCTL Director, Dr. Lerner, is co-Chair of the Autism Spectrum and Developmental Disorders (ASDD) Special Interest Group (SIG). This SIG is committed to sharing and disseminating recent findings and ideas related to ASD and developmental disorders, as well as promoting training in evidence-based methodologies in across psychosocial interventions for this population. For more information, or to join the ASDD SIG, visit the SIG website. For more information on ABCT, please visit their website. SCTL Director Dr. Matthew Lerner shared several talks throughout different days of the conference, such as "Moderators and Mediators of Youth Treatment Outcomes: Where to From Here? ", "Autism Spectrum and Developmental Disorders" , "Informant Discrepancies Define Discrete,Clinically Useful Autism Spectrum Disorder Subgroups". He was also a panelist on the Clinical Round Table discussing "Mechanisms of Change in CBT for Autism Spectrum Disorder: Knowledge and Process-Based Interventions" during the General Session. Undergraduate student Samantha Sommer delivered a talk on "Separation Anxiety Moderates Social Skills Intervention Outcomes in Youth with Autism Spectrum Disorders". Co-authours include graduate students Erin Kang, Tamara Rosen, Mary Christine O'Brien, Alexander Mulhall and SCTL Director Dr. Matthew Lerner. Graduate student Erin Kang, with co-authours Samantha Sommer, Alan Gerber and SCTL Director Dr. Matthew Lerner presented the poster "Gender Differences in Treatment Response to a Social Skills Intervention for Children With Autism Spectrum Disorder." Graduate student Cara Keifer, with co-authours Rebecca Weber, Anthony Burns, Amada Stoerback and SCTL Director Dr. Matthew Lerner presented the poster "In Vivo Social Attention Training Improves EEG-Indexed Facial Processing Speed." Graduate student Tamara Rosen, with co-authours Erin Kang, Elliot Keenan, Jingwen Jin, Rebecca Weber and SCTL Director Dr. Matthew Lerner presented the poster "Do affective processing impairments in ASD extend to non-social stimuli? Findings from an olfaction task." Graduate student Tamara Rosen, with co-authours Rebecca Weber, Erin Kang, Anthony Burns and SCTL Director Dr. Matthew Lerner presented the poster "Effects of In-vivo Social Attention Training: Improvements in Empathy and Moderation by EEG-indexed social processing." The Asperger Syndrome & High Functioning Autism Association, in collaboration with the Adelphi Center for Health Innovation, hosted their annual Fall conference at Adelphi University. The Keynote Speaker this year was renown author and psychologist Dr. Tony Atwood, author of The Complete Guide to Asperger's Syndrome. The Social Competence & Treatment Lab held an informational table and was glad to connect once again with its wonderful families and providers. As always, we are very excited to continue working with AHA! For event details, please follow this link. The Longwood Special Education Parent Teacher Association (SEPTA) hosted a Special Needs Resource Fair at Longwood Middle School. The Social Competence and Treatment Lab was excited to have a table open to families and share about our research! For more details on the Longwood SEPTA, please visit their website. The Autism Speaks Walk was created to raise awareness and funds for the cause of Autism Speaks. The Social Competence and Treatment Lab is pleased to attend for the first time! We plan to have a table at their Resource Fair - come check us out! We look forward to connecting with the thousands of people planning to attend. For event details, please follow this link. As in previous years, parents and children alike enjoyed this event. If you missed it, keep your eye out for a future fall event later on in the school year! The Social Competence and Treatment Lab was so pleased to attend The First Annual Family Fun Day hosted by the Suffolk Asperger/Autism Support and Information Group! The event took place at Gersh Academy at West Hills. We were so excited to take part of a fun time to connect with families in the area and we look forward to future events! For more information on this event, please see this flyer. SCTL Director Dr. Matthew Lerner presented at the Rising Stars of Clinical Science Symposium at the 28th Annual Convention of The Association for Psychological Science! Professionals across several disciplines within Psychological Science presented on many different themes, including "Breaking Free – Intersecting Perspectives On the Science Of Behavior Change", "Advancing Psychological Science through Technology" and "The Meaning of Time". To learn more about the Convention, please click here. The International Society for Autism Research (INSAR) hosted its 16th Annual International Meeting for Autism Research, a conference devoted to "exchange and disseminate new scientific progress among ASD scientists and their trainees from around the world". Eight SCTL lab members presented talks and/or posters! The meeting this year was held in Baltimore, Maryland. SCTL Director Dr. Matthew Lerner spoke at both the Psychology Department Colloquium and the Developmental Area of the "Brown Bag" Lecture Talks at the University of Kentucky. The Social Competence and Treatment Lab was pleased to host the Suffolk Asperger/Autism Support and Information Group for a talk right here on the Stony Brook campus. The SCTL had the delightful opportunity to connect with parents in the community, and looks forward to future communications. an interactive panel, led by Patrick Smith, discussing the development of a mental health awareness initiative on campus. There were also amazing performances by our talented student groups here at Stony Brook. The panel discussion, "Autism: The Benefits of Early Diagnosis and Intervention" was led and hosted by experts from the Stony Brook Center for Autism Spectrum Disorders, including SCTL Director Dr. Lerner. The SCTL was glad to be a part of such an event right here at Stony Brook! 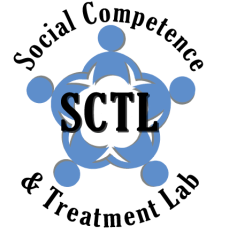 The Social Competence & Treatment Lab held an informational table and happily connected with new providers, community contacts and family members in the community. This year's Conference was titled, "Best Practices for Developing Social Competence, Self-Management Skills and Positive Outcomes for Students with Autism Spectrum Disorders" and welcomed Teachers, School Administrators, School Counselors, Social Workers, School Psychologists, Related-Service Providers, Community Professionals, parents and family members who live or work with individuals on the autism spectrum. SCTL Director Dr. Lerner spoke regarding "New Directions in Understanding and Treating Social Competence in ASD". Dr. Lerner discussed “therapeutic mechanisms” in the context of current and past interventions treating social challenges in youth with ASD, identified subtle yet crucial differences between various models, and explained and how to use these differences as a way to help determine what types of treatments might work best for which individuals. For more information on the Conference, please visit http://www.albany.edu/autism/conferences_annual.php. This Autism Symposium, titled "Lessons on Growing up with Autism: A Focus on Advocacy, Employment and Sexuality," welcomed parents, professionals, advocates and other interested community members to learn about the latest research and innovative program models that address issues facing individuals with autism as they age into adulthood. We are proud that one of our SCTL Research Assistants, Elliot Keenan, was spoke on a panel at this event, answering questions on friendship and dating. For more information on the Hilibrand Autism Symposium, visit their website. The Asperger Syndrome & High Functioning Autism Association hosted their annual Spring conference focusing on "Issues in Independent Living for Adolescents and Adults on the Autism Spectrum" with keynote speakers John Elder Robison and Liane Holliday Willey. This special conference fell on World Autism Awareness Day (WAAD), making it that more important and meaningful! The Social Competence & Treatment Lab held an informational table and had the opportunity to meet with many families and providers, as well as exchange ideas with other agencies and centers for individuals on the spectrum. As always, we are very excited to continue working with AHA! SCTL director Dr. Matthew Lerner spoke at the Special Education Parent-Teachers Association (SEPTA) meeting in North Shore School District regarding the different studies the SCTL is currently running. The SCTL is happy to have once again had the opportunity to meet with parents and teachers in the community and continue the conversation on ASD research. For information on SEPTA meetings, please visit NS SEPTA. The Social Competence and Treatment Lab (SCTL), the Autism Awareness Club and The Department of Music at Stony Brook University hosted The second annual “Stony Brook Autism-Friendly Music Event” right here at The Staller Center! The event featured opportunities for children with ASD and their families to enjoy both listening music or interactively conducting and dancing. The SCTL was glad to be able to connect with families in the community and promote a welcoming, fun and lively atmosphere for their children. We here at the SCTL are looking forward to next year’s event ! If you would like to receive a direct email invitation to register for this event when it next occurs, please email the SCTL at lernerlab@stonybrook.edu and mention "future ASD & Music events." The Social Competence and Treatment lab attended the Second Annual Quad Preparatory School Conference, “Breakthroughs in Twice Exceptional Education ‘16”. The SCTL held an informational table and SCTL Director Dr. Matthew Lerner presented a talk as a Breakout Session Speaker. The SCTL was glad to once again be a part of this event and was delighted to network with different providers. For more information on the Quad Preparatory School, please visit their website.